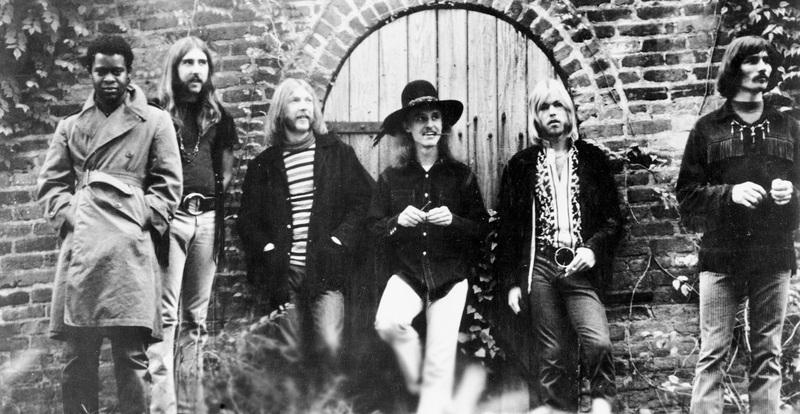 The Allman Brothers Band: Jaimoe, Berry Oakley, Duane Allman, Butch Trucks, Gregg Allman, Dickey Betts. Macon, GA, Rose Hill Cemetery, 1969. There have been many incarnations of The Allman Brothers Band, but this is how it began 50 years ago on March 26th, 1969 in Jacksonville, FL. Jai Johanny “Jaimoe” Johanson, Berry Oakley, Duane Allman, Butch Trucks, Gregg Allman, and Dickey Betts. What followed was five decades with dozens of studio, live, and compilation albums, highlighted by thousands of live performances that solidified The Allman Brothers Band as one of the best live bands in history. 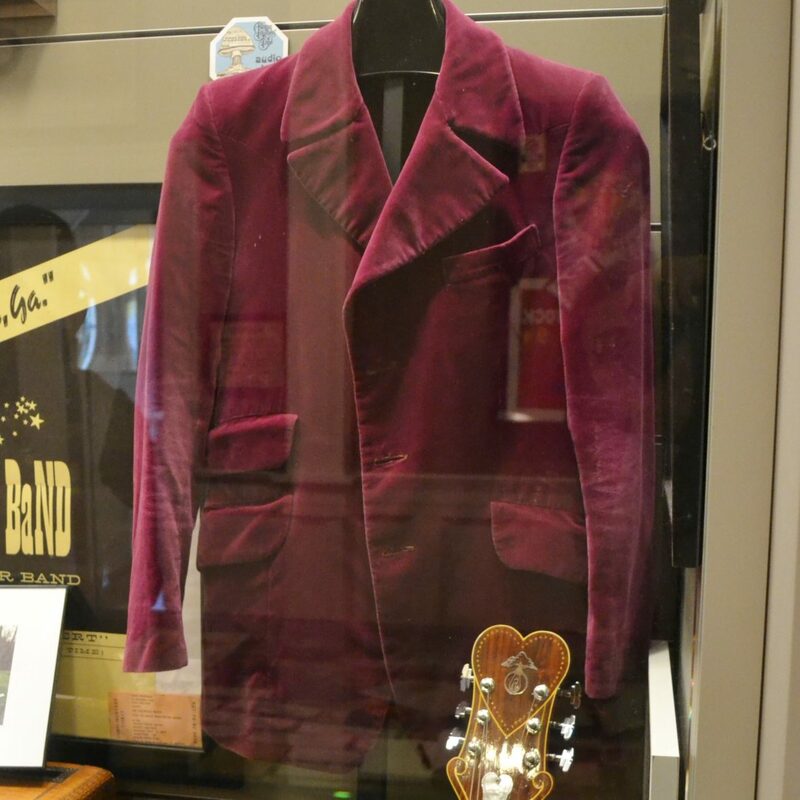 The legacy of The Allman Brothers Band lives on indelibly in their music, with their fans, and is anchored at The Big House Museum in Macon, GA where the band called home for many years. Renovated by The Big House Foundation and opened in November 2009, it is an interactive museum dedicated to identifying and preserving the history of The Allman Brothers Band. The Big House is celebrating the 50th Anniversary with FREE admission all day, sales and a few surprises. They made this 50th anniversary T-shirt that you can buy at the museum gift shop or HERE on-line. The Big House is also working on a beautiful coffee table book showcasing the highlights of their massive collection in honor of those 50 years of rock. Read more about this new book project HERE on The Big House website. In celebration of The Allman Brothers Band 50th Anniversary, consider becoming a member of The Big House or contributing to the Kickstarter program for The Big House Museum Photo Book. Gregg always said that The Allman Brothers had the best and most passionate fans he could imagine and “The Big House is where it all got figured out”. The incredible array of paraphernalia and house itself tell a great story of one of American’s greatest rock n’ roll bands. Gregg’s team visited The Big House recently and met up with Chank Middleton, Gregg’s oldest and closest friend, to get the story behind a few of Gregg’s items in the museum. Chank’s memory for details is extraordinary and his story telling is even better. This photo was taken during the time that Chank and Gregg lived together in Macon from April of 1974 to May 1976. Gregg’s friend, Gilbert Lee, who lived just down the street was a budding photographer and wanted to get some pictures of Gregg with his new car. Gregg had recently bought this Xcalibur from Automotive Classics in Santa Monica, CA. Gregg put on his purple suit and they set off just down the street to take the photos. Chank came along as well as Leroy, Gregg’s German Shephard. The photos are a great representation of Gregg and his life at that time. You can find many of Gilbert’s photos on exhibit at The Big House and for sale at The Morrison Hotel Gallery. Leroy, the German Shephard, has his own story. He came into Gregg’s life at a bar called Uncle Sam’s. On the outskirts of Macon, GA, the bar was owned by Capricorn Records President Phil Walden. Gregg and Chank were having a drink when they struck up a conversation with a man who wanted to sell his German Shephard. Having always wanted a German Shephard, Gregg gave the guy $75 and told him to deliver the dog to Capricorn Studios in downtown Macon. It just so happened that day, Bonnie Bramlett, another Capricorn artist and friend, was recording at the time the man brought Leroy to the studio. 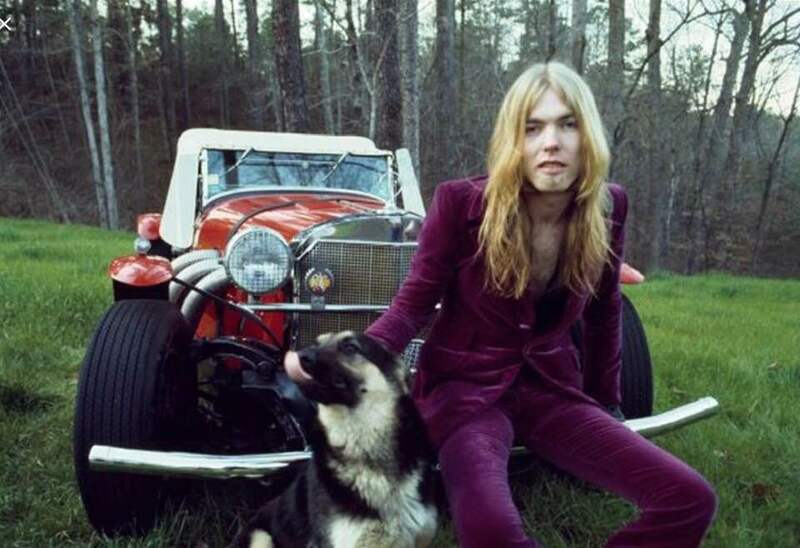 Apparently, Leroy wasn’t excited to go into the studio so the man was kinda dragging the dog down the street to get him there for for Gregg. Bonnie, did not like the way the man was pulling the dog and decided to “rescue” Leroy giving the man a good what for and more in the process. Bonnie got Leroy safely to the studio not knowing that was just where he was supposed to be. 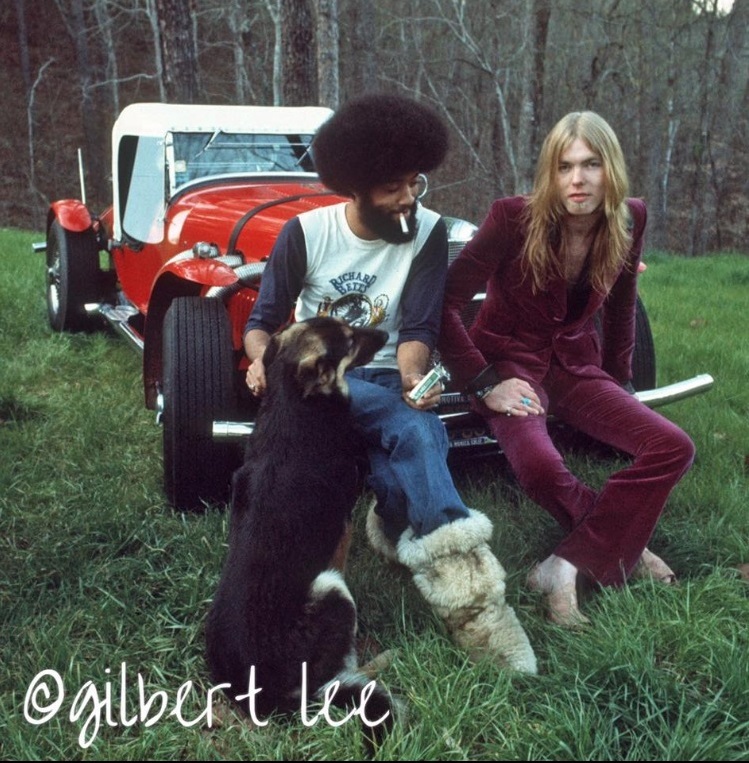 When the Allman Brothers broke up in 1976, Gregg moved to Florida while Chank and Leroy stayed in Macon. Leroy was with Chank for another 13-14 years. Chank said he was the best dog ever. Chank’s next story took us to Gregg’s lyric notebook from the beginnings of ABB. Several months after Gregg moved to Florida in the spring of 1976, a few boxes of Gregg’s stuff from the house where they lived together showed up at Chank’s house. Not interested in unpacking anything at the time, Chank put the boxes away and didn’t open for another year or so. When he finally did open them, he found Gregg’s lyric notebook including these first lyrics for “Don’t Keep Me Wondering”. Chank tried to give the book to Gregg some time later, but Gregg asked Chank to hold on to it. Chank did until he was able to give it to the safe keeping of The Big House. What a treasure! Chank and Gregg. Brothers. Photo by Patricia O’Driscoll.